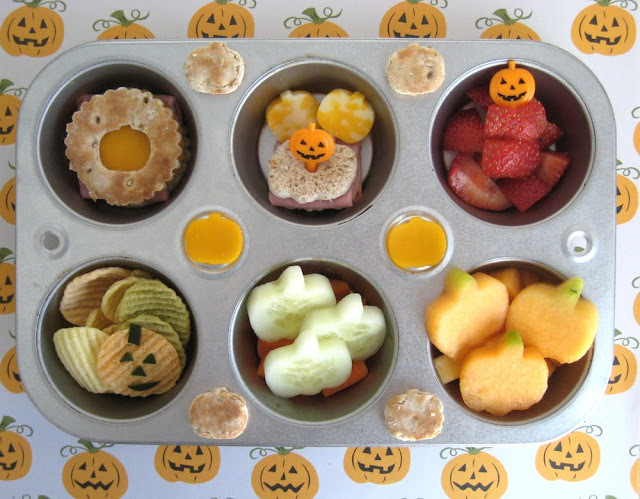 Since I'm loving all the Halloween festivities, this week's Muffin Tin Monday was just perfect!!! This week's theme was pumpkins and I do have lots of pumpkin goodies to use. Unfortunately, we ran out of pumpkin cake, so everything is pumpkin-shaped but nothing is pumpkin flavored. I'll fix that tomorrow. ACK! :)That chip jack-o-lantern is so cute! Love how you got a little green rind as the pumpkin stem on those melon ones! I wish I had thought to make a little pumpkin punched out of the top piece of bread on my sandwich! Love it! I love all your pumpkins. The linzer sandwich is so cute. Love the veggie chip and how creative to do the cantaloupe pumpkins that way so the rind shows as the stem... genius! The veggie chip pumpkin is super cute! So cute! Great tin! Love the chip jack-o-lantern! I love the chip jack o' lantern! So cute! I might have to use you as inspiration! I have veggie chips, but no food marker, so I would have to get little pieces of paper for decorating a chip. Very cute lunch!